At its core, The Moon and You is a charismatic husband-and-wife team. 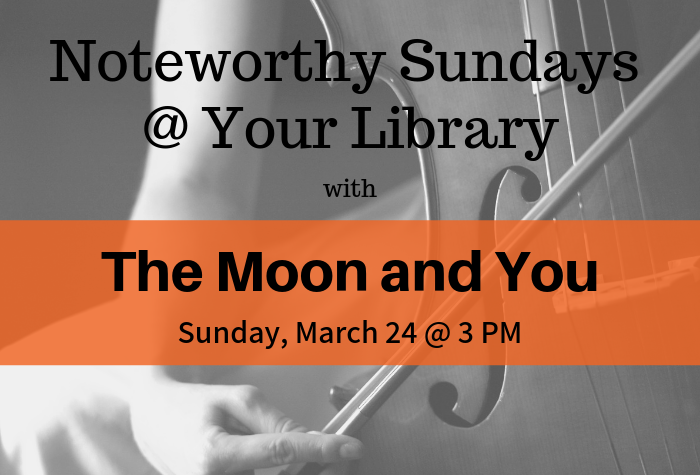 Melissa Hyman plays cello, Ryan Furstenberg plays guitar and banjo, and both sing in “voices that sound like they were made for one another” (Bill DeYoung, Connect Savannah). But whatever you might assume based on their gorgeous vocal blend and heartfelt lyrics, this ain’t your basic folk duo. With a rotating cast of talented friends to add unexpected instrumentation to their lineup, The Moon and You never plays the same show twice. This ever-evolving, expandable and collapsible model leaves the band constantly reinventing itself in ways both surprising and satisfying. For more information, visit: http://www.themoonandyou.com/. This concert is free to attend. Registration is not required, but is appreciated.